LEGO and TEDDY BEAR action! How will Darth Vader cope with the guilt of cutting Luke's hand, killing Obi-Wan and hurting Leia during the holiday season? It is a time of despair, after another galactic war. The people of the planet have started to challenge the new ruler of the remains of what seems to be a republic. Revolt, violence, with the crime wave rising, a group of scientist have created a device that can rid a person from space and time and teleport him back to the present. During 2008 I had been watching a lot of the MTV show celebrity Death Match. 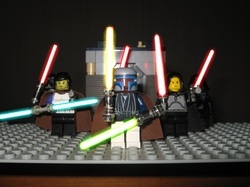 And I wanted to do something similar with my LEGO Star Wars figures. It was at this time I decided to turn my Star Wars Apocalypse video into a series of Star Wars videos that allowed me to try out and practice new techniques, so will future Star Wars Apocalypse videos be about trying new forms of animation and special effects. 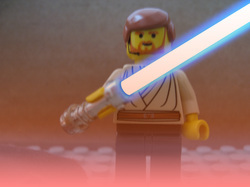 With this one, it was trying out a lightsabers plug-in for Adobe After Effects trying to use chroma key with Legos. and finally a programme called Wondertouch Particleillusion v3.01A, a very nice and easy to use effects program... Sadly due to a hard drive failure I have lost all the raw files and the higher resolution copy of this movie. What I have left is a high resolution trailer and the youtube copy of this video. A thousand years ago, the old republic carries on growing. With the sith defeated by the jedi, there seemed to be peace. Research continues and a technology grows. It wasn't long before a new space ship was designed, a space ship that could carry a whole colony of people to new worlds far beyond the known galaxy. It is 2008 and my mood for making a Star Wars video started to come back. But I always wanted to take Star Wars into a more serious and darker tone. Some of the books and games touch on it but tend to stay close with more child friendly tones. Even with Revenge of the Sith, I felt there was no Star Wars content dark enough. So I set out to make a dark tale where evil wins and the main character is left in despair for the rest of time. I also wanted to make an extra video about what happened to the main character, release that one first so that the audience would know there was no happy ending and keep them waiting for the bad to happen. The teaser short was to include Darth Vader but I felt I could not do his character justice so I wrote a script using only voice clips from the video game Star Wars Galactic Battlegrounds. As with the main film, I had not learned how to animate with Adobe Premier or how to use green screen. I had learnt however how to use transparent backgrounds on photoshop, so with the combination of MS Powerpoint a few pictures and a camera in front of the monitor, I created those effects.Today I do not look back at this project with much pride. I treat it more as a failure, the only parts I like were the sets of the start and the final fight, the rest I felt I could had done better, MUCH better. Still.. this is part of my history and it is a lesson that I have to try harder. Years after the death of jedi Luke Skywalker, a group of dark jedi have decided to search for the technology that once kept the jedi and sith alive, the technology of Darth Vader. They believe it will make them stronger and allow them to destroy the jedi once and for all. Will the Jedi stop them in time? The idea for this was very simple, I wanted a video to have many of the coolest character, Darth Vader, to appear on the screen. After making that short fight scene from Episode III, I wanted more! More battles and more deaths, because animated lego death is always funny, and there we go, the 1st of many Jar Jar deaths started. When I made this back in 2007 I knew I was too young and doing voices would make it sound stupid, so I gave up writing a script and decided to stick to a VERY simple story and had all the background stuck into the title scroll. I was still in the middle of learning skills and short cuts within adobe photoshop. I was using CS2 and my friend Sam Walker had got Adobe Premier Elements 2.0 on his Dell XPS laptop. After I used it for the EPIII fight scene I wanted to do more and learn more. My brother helped me with a few shots as I ran out of hands -_- but otherwise thanks to him and Sam for letting me use his laptop! Looking back god Revenge of the Sith was a horrible movie, I actually don't mind The Phantom Menace apart from Jar Jar and bad acting from that stupid kid... And I liked Attack of the clones because there was more character story like the old trilogy. But My point was that I am sure I was like a lot of people and got super hyped for the movie, I read the novelization (better than the movie) I watched the trailers over and over again and so on. And I made this short video. The red carpet at home served as lava. This video took a LONG time to make, as I had to draw lightsabres for hours and hours. I still look back at this project with a smile much like the innocences of my 1st ever video. 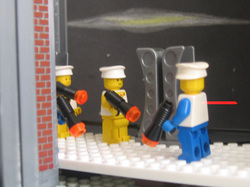 My first ever LEGO video. So of cos the footage looks rubbish for now. I had no experience and no one taught or help me. But I had a simple idea, to replace the Rancor from Return of the Jedi with a teddy bear. 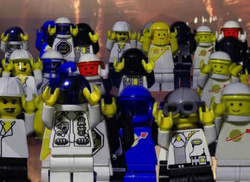 So I took a sound clip from the movie, cut it down as it was too long then filmed the lego. A few photos for walking then the rest was video and a basic MS paint work. For the teddy bear, one of my hand held the camera filming, the other hand, I used my thumb to steady the head of the teddy so it won't fall over. With the same hand, I pushed the button of a Jurassic Park The Lost World T-Rex and used my thumb to move the teddy's head.